The Green Bay Packers are a professional American football team based in Green Bay, Wisconsin. The Packers compete in the National Football League (NFL) as a member club of the league's National Football Conference (NFC) North division. It is the third-oldest franchise in the NFL, dating back to 1919,   and is the only non-profit, community-owned major league professional sports team based in the United States. Home games have been played at Lambeau Field since 1957. Earl Louis "Curly" Lambeau was a professional American football player and coach in the National Football League (NFL). Lambeau, along with his friend and fellow Green Bay, Wisconsin native George Whitney Calhoun, founded the Green Bay Packers in 1919. From 1919 to 1929, Lambeau served as a player-coach and maintained de facto control on the day-to-day operations of the team. As a player, Lambeau lined up as a halfback, which in the early years of the NFL was the premier position. He was the team's primary runner and passer, accounting for 35 touchdowns in 77 games. He won his only NFL championship as a player in 1929. George Whitney Calhoun was an American newspaper editor and co-founder of the Green Bay Packers, a professional American football team based in Green Bay, Wisconsin. After establishing the Packers in 1919 with Curly Lambeau, Calhoun served the team in various capacities for 44 years until his death in 1963. Utilizing his editorial job at the Green Bay Press-Gazette, he became the team's first publicity director, helping to establish local support and interest. He also served as the first team manager and was a member of the board of directors of the non-profit corporation that owns the team. Although often overshadowed by the more famous Curly Lambeau, Calhoun was instrumental to the early success of the Packers. In recognition of his contributions, Calhoun was elected to the Green Bay Packers Hall of Fame in 1978. The Green Bay Packers were founded on August 11, 1919  by former high-school football rivals Earl "Curly" Lambeau and George Whitney Calhoun. Lambeau solicited funds for uniforms from his employer, the Indian Packing Company. He was given $500 ($7,200 today) for uniforms and equipment, on the condition that the team be named for its sponsor. The Green Bay Packers have played in their original city longer than any other team in the NFL. The Indian Packing Company was a company that was involved in the canned meat industry and was organized in Delaware on July 22, 1919. Its canned meat sold as "Council Meats." When the company was absorbed by the Illinois-based Acme Packing Company in 1921, it had facilities in Green Bay, Wisconsin; Providence, Rhode Island; Greenwood, Indiana; and Dupont, Indiana At the time of the sale it was controlled by New England Supply Company of Providence, Rhode Island with F.P Comstock as its principal owner. The Hungry Five are the five Green Bay, Wisconsin area businessmen who were instrumental in keeping the Green Bay Packers franchise in operation during its early years. They raised funds, incorporated the team as a non-profit corporation, sold stock, established the Green Bay Packers Board of Directors and otherwise promoted the franchise. The arrival of end Don Hutson from Alabama in 1935 gave Lambeau and the Packers the most-feared and dynamic offensive weapon in the game. Credited with inventing pass patterns, Hutson would lead the league in receptions eight seasons and spur the Packers to NFL championships in 1936, 1939 and 1944. 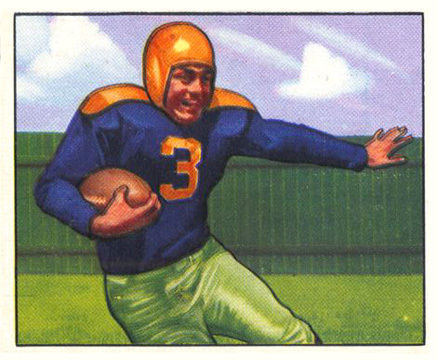 An iron man, Hutson played both ways, leading the league in interceptions as a safety in 1940. 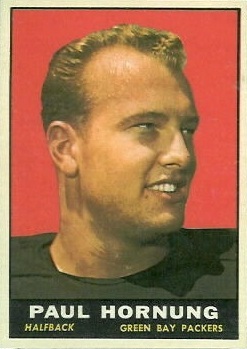 Hutson claimed 18 NFL records when he retired in 1945, many of which still stand. 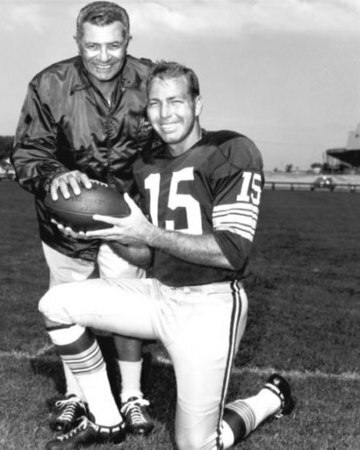 In 1951, his number 14 was the first to be retired by the Packers, and he was inducted as a charter member of the Pro Football Hall of Fame in 1963. The Packers returned to the NFL Championship game the following season and faced the New York Giants in the first league title game to be played in Green Bay. The Packers scored 24 second-quarter points, including a championship-record 19 by Paul Hornung, on special "loan" from the Army (one touchdown, four extra-points and three field goals), powering the Packers to a 37–0 rout of the Giants, their first NFL Championship since 1944. It was in 1961 that Green Bay became known as "Titletown." 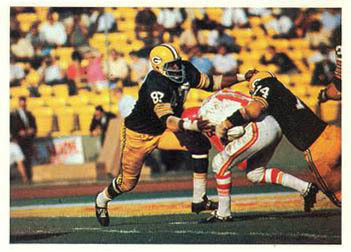 The Packers stormed back in the 1962 season, jumping out to a 10–0 start, on their way to a 13–1 season. 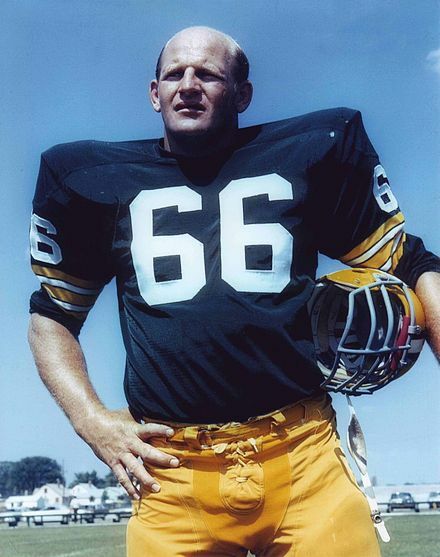 This consistent level of success would lead to Lombardi's Packers becoming one of the most prominent teams of their era, and to being featured as the face of the NFL on the cover of Time on December 21, 1962, as part of the magazine's cover story on "The Sport of the '60s". Shortly after Time's article, the Packers faced the Giants in a much more brutal championship game than the previous year, but the Packers prevailed on the kicking of Jerry Kramer and the determined running of Jim Taylor. The Packers defeated the Giants in New York, 16–7. The 1967 season was the last for Lombardi as the Packers' head coach. The NFL Championship game, a rematch of the 1966 contest against Dallas, became indelibly known as the "Ice Bowl" as a result of the brutal conditions at Lambeau Field. Still, the coldest NFL game ever played, it remains one of the most famous football games at any level in the history of the sport. With 16 seconds left, Bart Starr's touchdown on a quarterback sneak brought the Packers a 21–17 victory and their still unequaled third straight NFL Championship. They then won Super Bowl II with a 33–14 victory over the Oakland Raiders. Lombardi stepped down as head coach after the game, and Phil Bengtson was named his successor. Lombardi remained as general manager for one season but left in 1969 to become head coach and minority owner of the Washington Redskins. In 1998, the Packers went 11–5 and met the San Francisco 49ers in the first-round of the NFC playoffs. It was the fourth consecutive year these teams had met in the playoffs and the sixth overall contest since the 1995 season. The Packers had won all previous games, and the media speculated that another 49ers loss would result in the dismissal of San Francisco head coach Steve Mariucci. Unlike the previous playoff matches, this game was hotly contested, with the teams frequently exchanging leads. With 4:19 left in the 4th quarter, Brett Favre and the Packers embarked on an 89-yard drive, which concluded with a Favre touchdown pass to receiver Antonio Freeman. This play appeared to give Green Bay the victory. But San Francisco quarterback Steve Young led the 49ers on an improbable touchdown drive, which culminated when Terrell Owens caught Young's pass between several defenders to give the 49ers a lead with three seconds remaining. Afterwards, the game was mired in controversy. Many argued that during the 49ers game-winning drive, Niners receiver Jerry Rice fumbled the ball but officials stated he was down by contact. Television replays confirmed the fumble, but referees were unable to review the play; the next season the NFL reinstituted an instant replay system. In the end, this game turned out to be the end of an era in Green Bay. Days later Mike Holmgren left the Packers to become vice president, general manager and head coach of the Seattle Seahawks. Much of Holmgren's coaching staff went with him, and Reggie White also retired after the season (but later played one season for the Carolina Panthers in 2000). During the 2009 NFL season, two match-ups between the franchise and its former quarterback Brett Favre were highly anticipated after Favre's arrival with the division-rival Vikings in August. The first encounter took place in Week 4, on a Monday Night Football game which broke several TV audience records. The scheduling of this game was made possible when Baseball Commissioner and Packer Board of Directors member Bud Selig forced baseball's Minnesota Twins to play 2 games within a 12-hour span. The Vikings won the game 30–23. Brett Favre threw 3 TDs, no interceptions, and had a passer rating of 135. The teams met for a second time in Week 8, Favre leading the Vikings to a second win, 38–26, in Green Bay. Rodgers was heavily pressured in both games, being sacked 14 times total, but still played well, throwing five touchdowns and only one interception. The next week, the Packers were upset by the win-less Tampa Bay Buccaneers. Following a players-only meeting, the team found some stability on the offensive line with the return of tackle Mark Tauscher bringing a minor halt to sacks to Rodgers and opening the running game to Ryan Grant and the other running backs. Green Bay finished the season strongly, winning 7 out of their last 8 games, including winning their 16th regular season finale in the past 17 seasons, and earning a NFC wild-card playoff bid with an 11–5 regular-season record. The Packers defense was ranked No. 2 and the offense was ranked No. 6 with rookies Brad Jones and Clay Matthews III becoming sensations at linebacker and young players like James Jones, Brandon Jackson, Jermichael Finley and Jordy Nelson becoming threats on offense. Rodgers also became the first quarterback in NFL history to throw for at least 4,000 yards in each of his first two seasons as a starter. Also, cornerback Charles Woodson won NFL Defensive Player of the Year honors after recording 9 interceptions, forcing four fumbles, 3 touchdowns and registering 74 tackles and 2 sacks. In fact, Woodson's 9 interceptions were more than the 8 collected by all Packer opponents that season. Though the defense was ranked high, injuries to Al Harris, Tramon Williams, Will Blackmon, Atari Bigby and Brandon Underwood severely limited the depth of the secondary and teams like the Minnesota Vikings and Pittsburgh Steelers used that to their advantage by unleashing aerial assaults against inexperienced players with the NFL's best receivers. 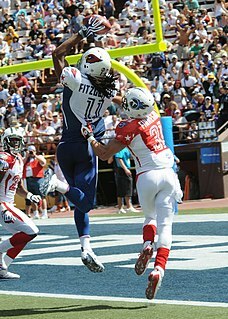 The season ended with an overtime loss in a wild card round shootout at the Arizona Cardinals, 51–45. The team lost Johnny Jolly to a season-long suspension after he violated the NFL drug policy. Their running corps suffered a blow when RB Ryan Grant sustained a season-ending ankle injury in Week 1. By the end of the season, the team had 16 people on injured reserve, including 7 starters: running back Ryan Grant, tight end Jermichael Finley, linebacker Nick Barnett, safety Morgan Burnett, linebacker Brandon Chillar, tackle Mark Tauscher, and linebacker Brad Jones. With an 11–5 record, the Packers beat the Minnesota Vikings in the NFC wild card round 24–10, but lost in the divisional round of the playoffs to the eventual NFC Champion San Francisco 49ers by a score of 45–31. The Packers offense finished the season fifth in points and eleventh in yards per game. The defense finished eleventh in points allowed and twenty-second in yards allowed per game. The Packers recorded their 700th victory, against the Bears, in Week 4. The team went undefeated at home for the first time since the 2011 season; they also led the league in scoring, with 486 points, the second-most in franchise history. The 2014 season also marked the first time since 2009 that the team had a 4,000-yard passer, two 1,000-yard receivers, and a 1,000-yard rusher. Overall, the team went 12–4, clinching the #2 seed in the NFC and a fourth consecutive NFC North division title, making the playoffs for the sixth straight season, tying a franchise record. The Packers beat the Cowboys in the divisional round, advancing to the NFC Championship to face the Seattle Seahawks. After leading throughout most of regulation, the Packers lost 28–22 in a historic overtime rally by Seattle. On December 3, against the Detroit Lions, the Packers quickly fell to a 20–0 deficit going into halftime. Green Bay started to make a comeback in the second half thanks to a touchdown by Davante Adams and a 27-yard touchdown run by Aaron Rodgers to bring the game within two points at 23–21. The Packers then got the ball back in their possession with 23 seconds left in the game. While attempting a "lateral" play, Rodgers was sacked with no time remaining but then a flag was thrown for a facemask penalty on Detroit. The Packers now had one more un-timed play, which Aaron Rodgers threw a 61-yard Hail Mary touchdown to tight end Richard Rodgers. It was the longest Hail Mary touchdown pass thrown in NFL history. Green Bay then finished the season 10–6 and 2nd in the NFC North behind the Minnesota Vikings. The Packers are the only community-owned franchise in American professional sports. Rather than being the property of an individual, partnership, or corporate entity, they are held in 2014 by 360,584 stockholders. No one is allowed to hold more than 200,000 shares,  or approximately 4% of the 5,011,557 shares  currently outstanding. It is this broad-based community support and non-profit structure  which has kept the team in Green Bay for nearly a century in spite of being the smallest market in all of North American professional sports. The city of Green Bay had a population of only 104,057 as of the 2010 census,  and 600,000 in its television market, significantly less than the average NFL figures. The team, however, has long had an extended fan base throughout Wisconsin and parts of the Midwest, thanks in part to playing one pre-season and three regular-season home games each year in Milwaukee through 1995. It was only when baseball-only Miller Park preempted football there that the Packers' home slate became played entirely in Green Bay. Green Bay is the only team with this form of ownership structure in the NFL, which does not comply with current league rules stipulating a maximum of 32 owners per team, with one holding a minimum 30% stake. The Packers' corporation was grandfathered when the NFL's current ownership policy was established in the 1980s. As a publicly held nonprofit, the Packers are also the only American major-league sports franchise to release its financial balance sheet every year. Packers fans are often referred to as cheeseheads,  a nickname for Wisconsin residents reflecting the state's bountiful cheese production first leveled as an insult at a 1987 game between the Chicago White Sox and Milwaukee Brewers. Instead, it came to be a statewide source of pride, and particularly since 1994 has been embraced by Packers fans. Bright orange triangular cheesehead hats are a fixture wherever the team plays. In August 2008, ESPN.com ranked Packers fans as second-best in the NFL. The team initially finished tied with the Pittsburgh Steelers (who finished ahead of the Packers) as having the best fans, but the tie was broken by ESPN's own John Clayton, a Pittsburgh native. 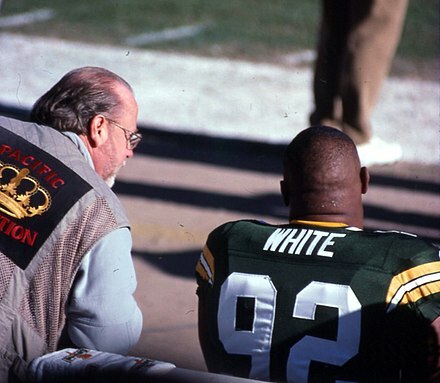 While several NFL teams choose to wear white jerseys at home early in the season due to white's ability to reflect the late summer sun rays, the Packers have done so only twice, during the opening two games of the 1989 season. However, the team did wear an all-white uniform in 2016 versus the Chicago Bears during the two teams' designated Color Rush game, in which Chicago wore all-navy uniforms. 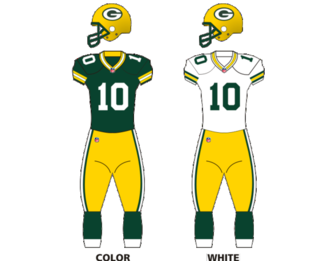 The Packers again wore an all-white uniform at Lambeau in the Color Rush game against the Bears (who again wore all-navy uniforms) in 2017. Although alternate gold jerseys with green numbers are sold on a retail basis, the team currently has no plans to introduce such a jersey to be used in actual games. After their early seasons at Bellevue Park and Hagemeister Park, the Packers played home games in City Stadium from 1925 to 1956. The team won its first six NFL world championships there. The Packers have been league champions a record 13 times,  topping their nearest rival, the Chicago Bears, by four. The first three were decided by league standing, the next six by the NFL Title Game, and the last four by Super Bowl victories. The Packers are also the only team to win three consecutive NFL titles, having accomplished this twice – from 1929 to 1931 under Lambeau, and from 1965 to 1967 under Lombardi. In nearly nine decades of Packers football, the Packers have formally retired six numbers. All six Packers are members of the Pro Football Hall of Fame and their numbers and names are displayed on the green facade of Lambeau Field's north endzone as well as in the Lambeau Field Atrium. The flagship station of the Packers Radio Network is Scripps Radio's WTMJ in Milwaukee, which was the former flagship of the Journal Broadcast Group before its merger with Scripps in April 2015. WTMJ has aired Packers games since 1929, the longest association between a radio station and an NFL team to date, and the only rights deal in American professional sports where a station outside of the team's main metro area is the radio flagship. While this might be unusual, the station can be heard at city-grade strength at all hours in Green Bay proper. Games air in Green Bay on WTAQ (1360/97.5) and WIXX-FM (101.1), and WAPL (105.7) and WHBY (1150) in Appleton and the Fox Cities. Wayne Larrivee is the play-by-play announcer and Larry McCarren is the color analyst. Larrivee joined the team after many years as the Chicago Bears' announcer. Jim Irwin and Max McGee were the longtime radio announcers before Larrivee and McCarren. When victory is assured for the Packers, either a game-winning touchdown, interception or a crucial 4th down defensive stop, Larrivee's trademark declaration of "And there is your dagger!" signifies the event. In limited circumstances where the Milwaukee Brewers are in either playoff or post-season contention and their play-by-play takes priority, WTMJ's sister FM station WKTI (94.5) currently airs Packer games to avert game conflicts. The TV rights for pre-season games, not nationally broadcast are held by Scripps television stations WGBA-TV (Channel 26) in Green Bay and WTMJ-TV (Channel 4) in Milwaukee,  along with Quincy Media's six ABC stations in the central, northern and western parts of the state, KQDS-TV (Channel 21) in Duluth-Superior, and in Escanaba/Marquette, Michigan, WLUC-TV (Channel 6), along with their Fox subchannel. As such, these stations are authorized to use the tagline Your official Packers station in their market area by the team, and also carry two weeknight programs; Packers Live on Tuesday evening, and the weekly coach's show, The Mike McCarthy Show on Wednesday evenings at 6:30 pm throughout the football season. Until the end of the 2011 season, the team's partner in Green Bay was WFRV-TV (Channel 5), and sister satellite WJMN-TV in Escanaba. As part of the 2012 deal, McCarren resigned his duties as sports director of WFRV to move to WTMJ/WGBA as a Packers analyst, becoming WGBA's official sports director on April 1, 2013, as his non-compete clause to appear as a sports anchor in Green Bay expired, though he retired as sports director in March 2015 to focus full-time on his duties for the Packer radio and television networks. WFRV/WJMN still airs any Packers regular season home games against an AFC team. ESPN Monday Night Football games, both pre-season and season, are broadcast over the air on Fox affiliate WLUK-TV in Green Bay and ABC affiliate WISN-TV (Channel 12) in Milwaukee (ABC affiliate WBAY-TV in Green Bay carried those games from 2006 until 2015;  the 2016 season was first where that station has not carried a Packer game in its history), while the stations airing Packers games in the NFL Network Thursday Night Football package have varied over the years depending on arrangements for syndication or co-network productions and simulcasts with CBS or NBC. WBAY's evening news anchor Bill Jartz also serves as the public address system announcer for Lambeau Field. The team's intra-squad Lambeau scrimmage at the beginning of the season, marketed as Packers Family Night, was broadcast for over a decade by WITI (Channel 6) in Milwaukee, and produced by WLUK-TV in Green Bay, both Fox affiliates which broadcast the bulk of the team's regular-season games, along with the state's other Fox affiliates until the 2016 season. In 2017, Scripps and the Packers Television Network began to originate the Packers Family Night broadcast. Lambeau Field is an outdoor athletic stadium in the north central United States, located in Green Bay, Wisconsin. The home field of the Green Bay Packers of the National Football League (NFL), it opened in 1957 as City Stadium, replacing the original City Stadium at East High School as the Packers' home field. Informally known as New City Stadium for its first eight seasons, it was renamed in August 1965 in memory of Packers founder, player, and long-time head coach, Curly Lambeau, who had died two months earlier. The 1967 National Football League Championship Game was the 35th NFL championship, played on December 31 at Lambeau Field in Green Bay, Wisconsin. Brett Lorenzo Favre is a former American football quarterback who spent the majority of his career with the Green Bay Packers of the National Football League (NFL). He was a 20-year veteran of the NFL, having played quarterback for the Atlanta Falcons in 1991, Packers from 1992 to 2007, New York Jets in 2008, and Minnesota Vikings from 2009 to 2010. Favre was the first NFL quarterback to pass for 500 touchdowns, throw for 70,000 yards, complete 6,000 passes, and attempt 10,000 passes. The Green Bay Packers are a professional American football team that has played professionally in the National Football League (NFL) since 1921. The team was founded in 1919 by Curly Lambeau and George Whitney Calhoun, and for the next two years played against local teams in Wisconsin and Michigan. In 1921, the Packers joined the American Professional Football Association, the precursor to the (NFL) with Curly Lambeau as their coach. After falling into financial trouble, the Green Bay Football Corporation, now known as Green Bay Packers, Inc., was formed in 1923. The Packers became a publicly-owned football team run by a Board of Directors elected each year. The team went on to win six NFL championships from 1929 to 1944, including three straight (1929–1931). Along the way, Curly Lambeau, with the help of receiver Don Hutson, revolutionized football through the development and utilization of the forward pass. The 1996Green Bay Packers season was their 78th season overall and their 76th in the National Football League, which culminated with the franchise winning its third Super Bowl and league-record 12th NFL Championship. The Packers posted a league-best 13–3 regular season won-loss record, going 8–0 at home and 5–3 on the road. It was the first time since 1962 that the club went undefeated at home. Additionally, the Packers had the NFL's highest-scoring offense (456) and allowed the fewest points on defense (210). Green Bay was the first team to accomplish both feats in the same season since the undefeated 1972 Miami Dolphins. They finished the season with the number one ranked offense, defense, and special teams. They also set a then NFL record for the fewest touchdowns allowed in a 16-game season, with 19. The Packers also allowed the fewest yards in the NFL and set a record for punt return yardage. Brett Favre won his second straight MVP award while also throwing for a career-high and league leading 39 touchdown passes. The 1967 Green Bay Packers season was their 49th season overall and their 47th season in the National Football League and resulted in a 9–4–1 record and a victory in Super Bowl II. The team beat the Dallas Cowboys in the NFL Championship Game, a game commonly known as the "Ice Bowl," which marked the second time the Packers had won an NFL-record third consecutive NFL championship, having also done so in 1931 under team founder Curly Lambeau. In the playoff era, it remains the only time a team has won three consecutive NFL titles. The 1995 Green Bay Packers season was their 77th season overall and their 75th in the National Football League. The Packers obtained an 11–5 mark in the regular season and won the NFC Central, their first division title since 1972. In the playoffs, the Packers defeated the Atlanta Falcons at home and the defending champion San Francisco 49ers on the road before losing to the Dallas Cowboys in the NFC Championship Game. Packers' quarterback Brett Favre was named the NFL's Most Valuable Player, the first of three such awards he would win. This was the first season that the Packers played home games exclusively at Lambeau Field, after playing part of their home slate at Milwaukee County Stadium since 1953. After losing their home opener to St. Louis, the Packers would win an NFL-record 25 consecutive home games between the rest of 1995 and early in 1998. The 1994 Green Bay Packers season was the team's 76th season overall and their 74th in the National Football League. The Packers posted a 9–7 record for their third straight winning season. 1994 marked the first of 8 seasons in which Packers' quarterback Brett Favre would throw more than 30 touchdown passes. It also marked the second season in which he started all 16 games for the Packers, starting a record-breaking starting streak which would continue throughout his career. This was the final season that the Packers played at Milwaukee County Stadium; they played home games exclusively at Lambeau beginning in 1995. Three Packers had the distinction of being named to the NFL's All-Time 75th Anniversary Team: Reggie White, Don Hutson, and Ray Nitschke. After defeating the Detroit Lions 16–12 in the NFC Wild Card Game, the season ended in a 35–9 loss to the Dallas Cowboys in an NFC Divisional Playoff Game. The Bears–Packers rivalry is a National Football League (NFL) rivalry between the Chicago Bears and the Green Bay Packers. The two clubs have won a combined 22 NFL championships, including five Super Bowl championships and have 65 members in the Pro Football Hall of Fame. The 2010 Green Bay Packers season was the 92nd season overall and their 90th season in the National Football League. Although they finished with only a respectable 10–6 record, good for a second-place finish in the NFC North, the Packers never lost a game by more than four points, and never trailed by more than seven the entire season, becoming the only team since the AFL-NFL merger in 1970 to accomplish this. All six of their regular season losses were by a combined 20 points. They entered the playoffs as the NFC's sixth seed. After defeating the Philadelphia Eagles 21–16 in the Wild Card round, the Atlanta Falcons 48–21 in the Divisional round and long time rivals, Chicago Bears 21–14 in the NFC Championship, the team advanced to Super Bowl XLV in which they faced the AFC's 2nd seed Pittsburgh Steelers. The Packers defeated the Steelers 31–25 to win their fourth Super Bowl and 13th NFL championship. The Packers became the second overall team after the 2005 Pittsburgh Steelers, and the first NFC team, to win the Super Bowl as a sixth seed, as well as becoming the second NFC team to win three straight road playoff games. The Packers–Vikings rivalry is an NFL rivalry between the Green Bay Packers and Minnesota Vikings. 1 2 3 "Birth of a Team and a Legend". Green Bay Packers. Archived from the original on February 18, 2014. Retrieved December 12, 2016. ↑ "Club Information" (PDF). 2018 Green Bay Packers Media Guide. NFL Enterprises, LLC. September 12, 2018. Retrieved September 17, 2018. ↑ "Green Bay Packers Team Capsule" (PDF). 2018 Official National Football League Record and Fact Book. NFL Enterprises, LLC. August 9, 2018. Retrieved August 14, 2018. 1 2 "Shareholders". Packers.com. NFL Enterprises, LLC. Retrieved January 22, 2015. ↑ "Packers Nickname Origin". Green Bay Packers. March 25, 2007. Archived from the original on October 23, 2006. Retrieved March 25, 2007. 1 2 Names, Larry D (1987). "The Myth". In Scott, Greg. The History of the Green Bay Packers: The Lambeau Years. 1. Angel Press of WI. p. 30. ISBN 0-939995-00-X. ↑ "Chronology of Professional Football" (PDF). National Football League. January 22, 2015. Retrieved January 22, 2015. ↑ "Green Bay Packers Team History". Pro Football Hall of Fame. Retrieved February 24, 2016. 1 2 Zirin, Dave (January 25, 2011). "Those Non-Profit Packers". The New Yorker . Retrieved December 28, 2014. ↑ Badenhausen, Kurt. "Full List: The World's 50 Most Valuable Sports Teams 2017". 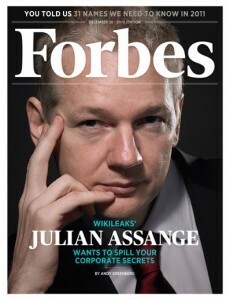 Forbes. Retrieved July 31, 2017. 1 2 "Super Bowls & Championships". Green Bay Packers. Retrieved December 12, 2016. ↑ Lambeau had played the 1918 season at Notre Dame under Knute Rockne and alongside George Gipp. He did not return to school the following year however due to illness which then led to the Packers birth. Names, Larry D (1987). "The Myth". In Scott, Greg. The History of the Green Bay Packers: The Lambeau Years. 1. Angel Press of WI. pp. 27–29. ISBN 0-939995-00-X. ↑ "The Acme Packers were short-lived". www.packers.com. Retrieved August 1, 2018. ↑ "A name 90 years in the making". archive.jsonline.com. Retrieved August 1, 2018. ↑ "The truth and myth about 'The Hungry Five'". www.packers.com. Retrieved August 1, 2018. ↑ "Dec. 8, 1929: Packers earn first league title" . Retrieved August 1, 2018. ↑ "History of Champions: Packers are No. 1 in NFL". Press Gazette Media. Retrieved August 1, 2018. ↑ "Green Bay Packers explain why three championship trophies are missing from Hall of Fame". Green Bay Packers. Retrieved August 1, 2018. ↑ "Team Records: Games Won" (PDF). National Football League. Retrieved December 12, 2016. ↑ "Don Hutson: Information from". Answers.com. Retrieved February 7, 2011. ↑ Fleming, David (September 27, 2013). "Blaze of Glory". ESPN . Retrieved December 9, 2014. ↑ Maraniss, David (September 14, 1999). "In throes of winter, a team in disarry is reborn". Milwaukee Journal Sentinel . Milwaukee, Wisconsin. p. 2B. Retrieved July 6, 2011. ↑ Pennington, Bill (January 16, 2008). "NYTimes article of January 15, 2008". The New York Times. Retrieved February 7, 2011. ↑ "TIME Magazine Cover: Vince Lombardi – Coaches – Wisconsin". Time.com. December 21, 1962. Retrieved August 15, 2014. ↑ "Vince Lombardi Record, Statistics, and Category Ranks | Pro-Football-Reference.com". Pro-Football-Reference.com. Retrieved August 1, 2018. ↑ "AP Was There: 1967 Cowboys-Packers Ice Bowl game". USA TODAY. Retrieved August 1, 2018. ↑ "The 100 Greatest Moments in Sports History | The Ice Bowl". Sports Illustrated's 100 Greatest Moments. Retrieved August 1, 2018. ↑ The 25 Biggest Sports Flops (1979–2004) Archived May 24, 2011, at the Wayback Machine from ESPN25. Obtained February 5, 2007. ↑ "ESPN.com: Instant replay comes back to haunt Holmgren". static.espn.go.com. Retrieved August 1, 2018. ↑ Walker, Ben (January 13, 2008). "Playful Favre accurate even with snowball". East Bay Times. Retrieved May 30, 2018. ↑ "NFL grants Favre reinstatement; sources say QB job is open". ESPN. August 3, 2008. Retrieved August 3, 2008. ↑ Jay Glazer (August 6, 2008). "Packers trade Favre to Jets". Fox Sports on MSN. Archived from the original on August 19, 2008. Retrieved August 6, 2008. The month-long saga has finally come to an end, with the Packers agreeing to trade their future Hall-of-Fame quarterback to the New York Jets, FOXSports.com has learned. ↑ "Brett Favre: Game Logs at". NFL. Retrieved February 7, 2011. ↑ "Super Bowl XLV, Packers Beat Steelers, 31–25". New York Times. February 7, 2011. Retrieved February 7, 2011. ↑ Farmer, Sam (February 7, 2011). "Ending is cheddar-perfect for Packers in Super Bowl XLV victory over Steelers". Los Angeles Times. Retrieved February 7, 2011. ↑ "2012 Green Bay Packers Schedule & Game Results". Pro-Football-Reference.com. Retrieved December 15, 2017. ↑ Wilner, Barry (July 31, 2012). "Packers top first-ever AP Pro32 rankings". The Washington Times. Retrieved July 31, 2012. ↑ Ketchman, Vic (September 28, 2014). "Win over Bears feels like season saver". Green Bay Packers. Retrieved September 30, 2014. ↑ Wesseling, Chris (August 23, 2015). "Jordy Nelson out for 2015 season with knee injury". National Football League. Retrieved December 12, 2016. ↑ "Green Bay Packers 2015 Regular Season Schedule - NFL.com". www.nfl.com. ↑ Rosenthal, Gregg (December 3, 2015). "Packers stun Lions on Aaron Rodgers' Hail Mary TD". National Football League. Retrieved December 12, 2016. ↑ "Ranking Aaron Rodgers' three Hail Mary completions". NFL.com. Retrieved August 1, 2018. ↑ "2017 NFL Regular Season Standings – Nation Football League". ESPN.com. Retrieved November 21, 2017. ↑ Boren, Cindy (October 15, 2017). "Aaron Rodgers could be out for the season, a sobering possibility for the Packers" . Retrieved November 21, 2017– via www.WashingtonPost.com. ↑ Wilde, Jason (November 4, 2017). "Packers: Aaron Rodgers to return this season if collarbone heals and 'it would make sense'". Wisconsin State Journal. Retrieved May 30, 2018. ↑ Hoffman, Benjamin (December 24, 2017). "Aaron Rodgers's Return to Injured Reserve May Have Violated League Rules". The New York Times. Retrieved May 31, 2018. ↑ Jones, Brian (January 16, 2018). "Packers WR Davante Adams named to 2018 Pro Bowl". 247Sports. Retrieved June 4, 2018. ↑ "Green Bay Packers shut out for first time in more than a decade". MontrosePress.com. Archived from the original on November 23, 2017. Retrieved November 21, 2017. ↑ "Packers miss playoffs for second straight year". Wisconsin Radio Network. 2018-12-17. Retrieved 2019-02-06. ↑ "Green Bay Packers 2018 Game Log". Pro-Football-Reference.com. Retrieved 2019-02-06. ↑ "Joe Philbin focused on interim coaching job, not permanent one". ESPN.com. 2018-12-05. Retrieved 2019-02-06. ↑ "Packers fire coach Mike McCarthy after 13 seasons". NFL.com. Retrieved 2019-02-06. ↑ Felt, Hunter (2018-12-03). "Why the Green Bay Packers fired Mike McCarthy". The Guardian. ISSN 0261-3077 . Retrieved 2019-02-06. ↑ "Tracing LaFluer's path from D.C. assistant to Packers head coach". NBC Sports Washington. 2019-02-04. Retrieved 2019-02-06. ↑ "Executive Committee And Board Of Directors". Green Bay Packers. Retrieved December 12, 2016. ↑ Hruby, Patrick. "The right way? The Green Bay way". espn.go.com. ESPN . Retrieved February 24, 2016. 1 2 3 4 "Shareholder History & Financial History" (PDF). Green Bay Packers. January 22, 2015. Retrieved January 22, 2015. 1 2 Saunders, Laura (January 13, 2012). "Are the Green Bay Packers the Worst Stock in America?". The Wall Street Journal . ↑ "2010 Census". US Census Bureau. Archived from the original on September 23, 2006. ↑ "Packers plan fifth stock sale". ESPN. Associated Press. December 1, 2011. Retrieved December 2, 2011. ↑ "Home". SportsBusiness Journal. Retrieved February 7, 2011. ↑ "Fans keep their eyes on the ball in Green Bay (Dallas Morning News)". Archived from the original on March 20, 2012. ↑ Harris Interactive Poll, Packers ranked No. 4 in 2006, No. 1 in 2005, No. 1 in 2004, No. 1 in 2002. 1 2 3 Gary D’Amato (January 19, 2011). "Packers season tickets worth the wait – 955 years for some on the list". Milwaukee Journal Sentinel . Retrieved February 24, 2011. ↑ "SI.com – Be the 74,659th In Line! – Oct 9, 2007". CNN. October 9, 2007. Archived from the original on January 13, 2010. Retrieved May 4, 2010. ↑ "David Morris and Daniel Kraker. "Rooting the Home Team: Why the Packers Won’t Leave—and Why the Browns Did". The American Prospect, no. 40 (September–October 1998), pp. 38–43. 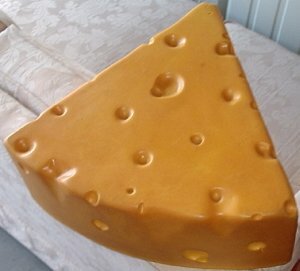 1 2 "The Big Cheese: Cheesehead inventor profits from insults". Archived from the original on July 14, 2014. ↑ "Letters to Lee Remmel, August 25, 2004". Archived from the original on December 26, 2008. ↑ "Packers Training Camp – Family Night". ↑ Mosley, Matt (August 29, 2008). "NFL's best fans? We gotta hand it to Steelers (barely)". ESPN. Retrieved August 30, 2008. 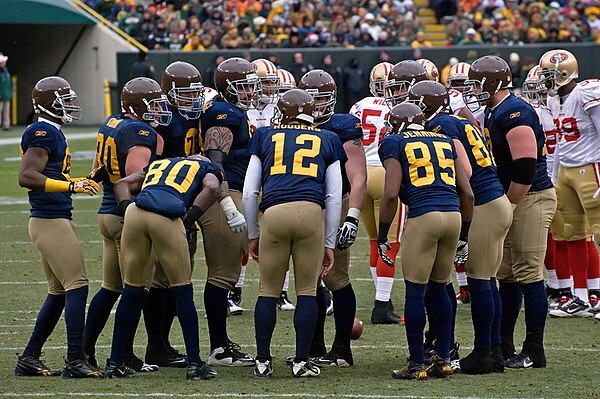 ↑ "Packers' alternate jersey a real throwback". Host.madison.com. March 12, 2010. Retrieved August 15, 2014. 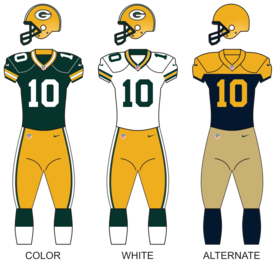 ↑ Packers uniform database Obtained February 5, 2007. ↑ Murphy, Thomas; Hurly, Jim (2011). Green Bay: A City and Its Team. Hurly Investments. ISBN 978-0-615-44464-2. ↑ "What Does the 'G' in the Packers Logo Stand for? (VIDEO)". Blippitt.com. February 2, 2011. Retrieved February 7, 2011. ↑ "Cheap Seats". Sioux City Journal. February 3, 2011. Retrieved February 7, 2011. ↑ "G still stands for gullible". Packersuniforms.blogspot.com. February 14, 2011. Retrieved August 15, 2014. ↑ Packers Fan Clubs from Packers.com. Obtained February 5, 2007. ↑ "Green Bay Packers Logo – Design and History". Dinesh.com. August 25, 2010. Archived from the original on November 22, 2010. Retrieved February 7, 2011. ↑ "Oval G is a Green Bay Packers trademark". ESPN. May 25, 2005. ↑ "Georgia Traditions". georgiadogs.com. Retrieved August 1, 2018. ↑ "Green Bay Packers to wear color rush uniforms vs. Chicago Bears". Green Bay Packers. Retrieved August 1, 2018. ↑ "There's No Service Like Wire Service, Vol. 6" . Retrieved February 22, 2010. ↑ "Packers in blue jerseys?". Archived from the original on February 25, 2010. Retrieved February 22, 2010. ↑ "New deal establishes Nike as league's official uniform provider". NFL.com. Retrieved August 1, 2018. ↑ Siefert, Kevin (April 4, 2012). "New unis: Packers reject all changes". ESPN.com . Retrieved November 16, 2012. ↑ "City Stadium". Packers 100 Seasons. Retrieved August 1, 2018. ↑ Investigates, Mark Leland, FOX 11. "FOX 11 Investigates: Close calls on the Packers calling Green Bay home". WLUK. Retrieved August 1, 2018. ↑ "How Lambeau Field saved the Packers in Green Bay". Packers News. Retrieved August 1, 2018. ↑ "Green Bay Packers Have Deep Roots in Milwaukee". FOX Sports. September 9, 2016. Retrieved August 1, 2018. ↑ "Sept. 29, 1957: Birth of Lambeau Field" . Retrieved August 1, 2018. ↑ "Green & Gold Package Scheduling". Packers.com. Retrieved August 22, 2012. ↑ "Complete Playoff Standings". profootballhof.com. Retrieved September 27, 2015. ↑ "Hall of Famers by Franchise". Pro Football Hall of Fame]]. Retrieved September 16, 2018. ↑ "History of the Hall". Wisconsin Athletic Hall of Fame. Retrieved August 1, 2018. ↑ "For helping shape the state sports landscape, Marques Johnson, Herbert V. Kohler Jr., Ron Wolf will be honored". Milwaukee Journal Sentinel. Retrieved August 1, 2018. ↑ "Packers Radio Station Listing". Packers.com. Retrieved February 7, 2011. ↑ "Packers Radio Network". Packers.com. Retrieved February 7, 2011. ↑ Wolfley, Bob (March 2, 2012). "Packers and Journal Broadcast Group announce partnership deal". Milwaukee Journal Sentinel . Retrieved March 3, 2012. ↑ "FOX 11 to air Hall of Fame Game, Packers MNF games". WLUK-TV. July 6, 2016. Retrieved July 7, 2016. ↑ "That '70s Show Episode Synopses". www.carseywerner.net. Retrieved August 1, 2018. ↑ Rich, Katey. "How the Green Bay Packers Cameo in Pitch Perfect 2 Happened". HWD. Retrieved March 3, 2018. ↑ Dubin, Jared (January 28, 2015). "WATCH: Key & Peele, Aaron Rodgers spoof player introductions". CBSSports.com. Retrieved August 30, 2018. 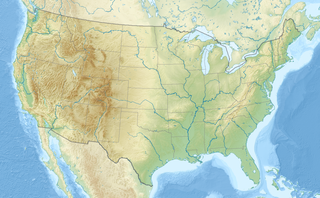 Wikimedia Commons has media related to Green Bay Packers .